Geneva, NY based food technology company RealEats is excited to announce its national debut on QVC this Monday from 3pm to 6pm. 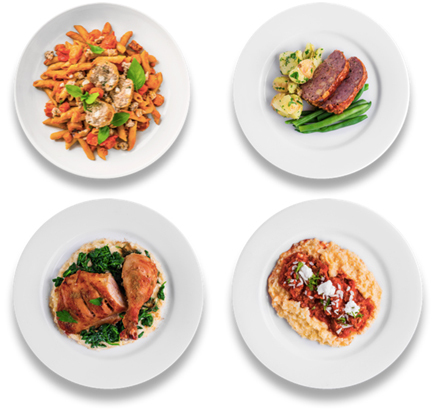 RealEats is the first company to offer sustainably sourced, sophisticated meals that are ready to eat in six minutes or less. While previously available in 21 states, RealEats’ QVC debut marks the first time the company will be able to ship its meals nationally. While Geneva, NY may not be first to mind as a hub for food technology, basing its operations in the City has been central to RealEats’ success. The City is in the heart of the Finger Lakes Agricultural Region, one of the richest food sheds in the northeast, and where RealEats sources all of the ingredients for its meals. RealEats also houses their commissary kitchen adjacent to the renowned Cornell Agritech Center, the most important food innovation and safety hub in the northeast. In less than a year since its official launch, RealEats now has more than 30 employees based in Geneva and is setting an example for other food-tech businesses to locate in underserved yet farm-rich regions of the state. “The City of Geneva congratulates RealEats on their newest opportunity of being on the nationally recognized shopping channel QVC and its exposure to expand their U.S. customer base. RealEats started its U.S. operation at the City of Geneva’s KitGen, a shared kitchen incubator; and they are an exemplary example of the growth envisioned for entrepreneurs in this space,” stated Mayor Ron Alcock, City of Geneva. Founder Dan Wise launched RealEats as a solution to a personal problem — as a single parent with two young kids and a full-time job he was struggling to consistently feed his kids healthy, delicious meals. There aren’t many healthy, affordable takeout options and other meal delivery services required significant cooking and prep time, and the wasteful packaging was also a concern. By adapting sous-vide technology (a popular cooking method used by chefs that involves poaching ingredients in vacuum sealed pouches in hot water), RealEats is able to offer QVC customers exclusive meals from renowned chef Katy Sparks such as BBQ Brisket Meatloaf, Whole Grain Pasta, Turmeric Chicken, and Turkey Ricotta Meatballs that are ready to eat after about 6 minutes of cooking in a pot of boiling water. Unlike most meal subscription services, RealEats also puts a heavy emphasis on sustainable packaging and has an extremely low plastic profile. The pouches are recyclable and BPA-free. Insulation liners and boxes are made from recycled materials (mostly plant fibers) and are recyclable. RealEats is also currently working on creating fully biodegradable pouches to minimize waste even further.